ECO ARTS AND CRAFTS IN PRIMARY SCHOOL: Our language assistant has arrived! WELCOME TO SPAIN! Our language assistant has arrived! WELCOME TO SPAIN! This year we will have a language assistant. Evan Morgan from Pensilvania! He will be helping us in the Eco Arts and crafts lessons! 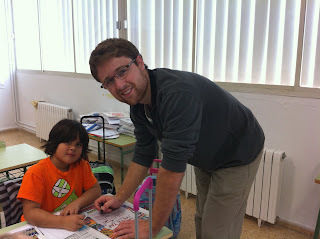 Thank you for coming and welcome to Ibiza and to CEIP Puig d'en Valls!